Editor’s Note: The 2018 GP schedule in this article was updated following an announcement on December 11, 2017. The format for GP Phoenix is now Modern, and GP Providence now takes place on August 17-19 with a main event format of Standard. Additionally, the date for Grand Prix Melbourne was updated after this announcement, and the venues for Melbourne and Nagoya were updated. For more details on these changes, please refer to this posting. I may be looking forward to the 2018 Grand Prix season more than any year before it, and not just because you can fight Dinosaurs with Pirates flying through the air like magical trapeze artists. Rather, I'm looking forward to changes being made to Grand Prix and other tournaments that will ensure these marquee events are more enjoyable than ever. The Day Two cut is moving to to 6-2 after eight rounds, while also tweaking what rounds take place on what days, based on format. The remainder of the 2018 Grand Prix Schedule has been finalized, and we reveal the 2018 Grand Prix promo card—Mutavault! The formula for Pro Tour invites coming out of Regional Pro Tour Qualifiers has been tweaked to adjust for attendance. 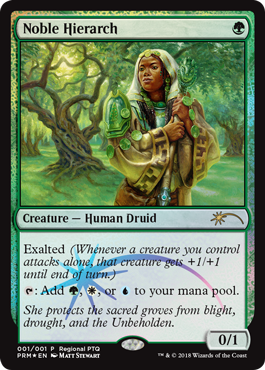 Finally, we have another RPTQ promo card to reveal—Noble Hierarch! And if you plan to attend any Grand Prix next year, I suggest starting at the top of this article and reading through till the Regional Pro Tour Qualifiers section. If you don't plan to attend any Grand Prix next year, well, you're missing out—and this Mutavault promo prove it. Starting with Grand Prix Santa Clara in January 2018, the number of rounds on Day One of a Grand Prix is changing, as is the cut to make Day Two. One area of consistent feedback over the last few years has been where to make the Day Two cut. In the not-too-distant past, only players who finished Day One at 7-2 or better moved on to Day Two—essentially everyone who was live to make the Top 8. That was shifted to 6-3 as Grand Prix continued to grow in size so that players could still win out and win some prizes, or even a Pro Tour Qualification. Both cuts had their issues, but with no win-loss record between 7-2 and 6-3 (ties notwithstanding), there wasn't much wiggle room. Working with CFB, we believe we've hit on a solution to help address the issue. Starting in 2018, all individual Constructed events will be eight rounds on Day One and seven rounds on Day Two, with the cut coming at 6-2 or better. For Team Grand Prix, Day One will also be eight rounds with a cut at 6-2, with six rounds played on Day Two before the Top 4. For individual Limited events, the Day Two drafts make things a touch tricky, but we're going to try a hybrid solution. Day One will continue to be nine rounds played with Sealed decks. However, there will be a cut after Round 8, and all players not at 6-2 or better will be eliminated. All remaining players will then play Round 9 with their Sealed deck, and all will be invited back for Day Two. The result, we believe, will help make days shorter all while finding that happy medium between the 7-2 and 6-3 cuts of yesteryear. But where, you might wonder, will you be able to partake in one of these Grand Prix? Excellent question. The first half of the 2018 Grand Prix schedule was revealed in July. Today—right here and right now, in fact—we are revealing the rest of the schedule, as well as the Grand Prix participation promo card: Mutavault, with art by John Avon! 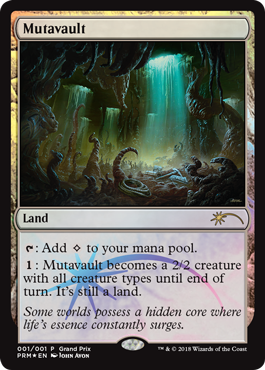 You can pick up your Mutavault copies starting with the first Grand Prix of 2018. We will be moving to a yearly schedule for Grand Prix promos, as seasons were a touch confusing for players. That means we will continue distributing the Progenitus Grand Prix promo through the end of December. Below you can find the full Grand Prix schedule for 2018. Each event listed will use the new Day One cut system. Everything below Grand Prix Barcelona is new! Tweaks are also being made to the Sunday Pro Tour Qualifiers run at Grand Prix in 2018, mostly to provide a smoother experience for players transitioning from the main event to the PTQ. All Sunday PTQs will use the format that was featured as the individual main event's format (more on team events in a moment). Yes, this includes Legacy Grand Prix, which will now feature Legacy PTQs on Sundays. Double-Grand Prix weekends will feature two PTQs, one for each format. As a reminder, all Sunday PTQs will always qualify a person for the Pro Tour that the main event feeds. So the winner of the Grand Prix and the winner of the Sunday PTQ will be invited to the same Pro Tour. This also means that there will be some differences in PTQ formats for Grand Prix with team main events. From January until May 2018, all team-format main events will feature Team Limited PTQs. After May, Grand Prix with team-format main events will feature individual Limited PTQs. This is due to the Pro Tours they feed—Pro Tour 25th Anniversary and the fall Pro Tour, respectively. Last, but certainly not least, merely attending one of the RPTQs feeding Pro Tour Dominaria will get you one of these beauties—Noble Hierarch with new art by Matt Stewart!